::: Off the Radar :::: Charli XCX, Little Daylight (+) Live this Saturday, June 8th at His & Hers! Charli XCX, Little Daylight (+) Live this Saturday, June 8th at His & Hers! 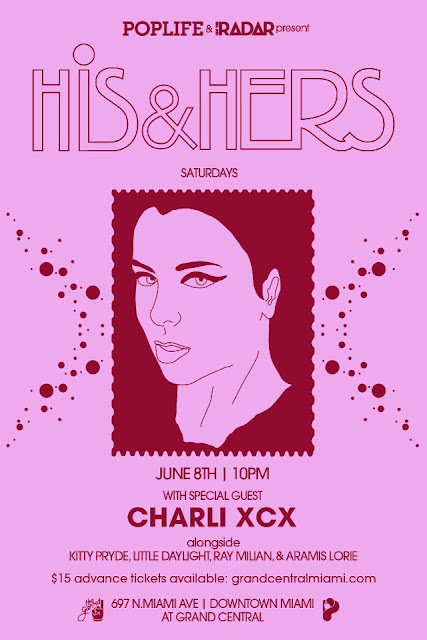 Pretty excited about the Charli XCX show we have coming up this Saturday, June 8th at our weekly party His & Hers at The Garret. First heard about UK's Charli XCX when Aramis would play "You (Ha Ha Ha)" back when we first started His & Hers earlier this year, and every time he did I would be like "who is that?" Amazingly catchy pop tune that I still have not gotten tired of. Since then I have listened to her debut album True Romance and have become a fan. Seems she also wrote Icona Pop's big breakthrough hit "I Love It" which I'm pretty sure you've probably heard on some commercial or TV show at some point in the last year or so. All pretty amazing for a girl all of 20 years young! Don't miss her at this intimate show before she blows up. Next time she comes around it may be at a much bigger venue. In fact I'm pretty sure of that. Also on the bill for this show is Kitty Pryde and Little Daylight who has this amazing track "Overdose", which is an irrissistable electro pop gem. Can't wait to catch them live as well. Check out some of those tunes/videos below. You can check out the facebook invite for the show here and purchase tix's for the event here for only $15! See ya Saturday!